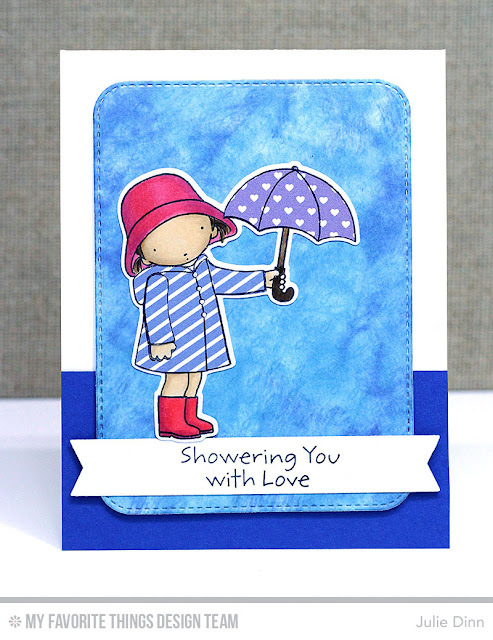 Are you ready to see another card with the adorable Pure Innocence Showering You with Love stamp set? This girl is just too cute! I stamped her on a piece of X-Press It card stock and coloured her with Copics. I paper pierced the raincoat and umbrella with prints from the Hearts & Stripes Patterned Paper. I added a touch of gloss to her wellies to give them that extra shine. The background was created using Faded Jeans and Broken China Distress Oxide Ink. I seriously can't stop using these new inks!